This website has been created for Canisius J. Kayombo to pursue a degree in botany. Botanical research and its practical application is critical to solve today's environmental problems, especially in East Africa which contains many biodiversity hotspots. We are seeking scholarships and grants for Canisius to complete his bachelor's degree in botanical science. The purpose of his degree is to provide local leadership in conservation efforts. 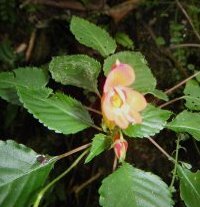 For twenty years, Canisius has worked for both private and state organizations in the field of botanical research. 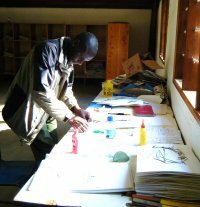 For the last ten years, he has been a research assistant, field supervisor, and field botanist/botanical technician at the National Herbarium of Tanzania; and a botanical instructor in charge of the nursery, arboreta, and the curator of the herbarium at the Forestry Training Institute. He has authored and coauthored numerous studies of East African plants that have been published in local journals and presented internationally. One person like Canisius Kayombo can make a difference. The botanical community and those dedicated to the preservation of the natural world are asked to commit funds in support of his education. Each year tuition and fees will cost approximately $6,000 US. Please browse through this website, and if you are able to help, we would welcome your donation (tax-deductible in the USA) by check, made payable to the Missouri Botanical Garden, and addressed to: Canisius Kayombo Fund, c/o Roy E. Gereau, Missouri Botanical Garden, 4344 Shaw Blvd., St. Louis, MO 63110, USA. For more information, please send a message to Roy.Gereau@mobot.org. Roy E. Gereau Eileen E. Cooper, PhD. September-October 2009 Biological Survey at Suye Hill Ecosystem Walk Trail, Arusha Municipality. Determination of Tree Species at Ihanzutwa Miombo Woodland, Mufindi District-Iringa.